Tesla Powerwall is a rechargeable lithium-ion battery manufactured by Tesla, Inc for households. Powerwall is a completely automated home energy storage product that can detect grid outage and power the house when needed. When integrated with home solar power generators Powerwall can store excess energy generated during the day and make it available for use when needed, thus reducing the home’s reliance on utility. Apart from being a backup power supply, Powerwall can also perform load shifting, storing energy when electricity prices are low and supplying energy when electricity charges are high. Tesla CEO Elon Musk announced the development of the company’s battery storage products Powerwall, for residential users and Powerpack, for commercial customers in April 2012. Both products were officially launched three years later on April 30, 2015. 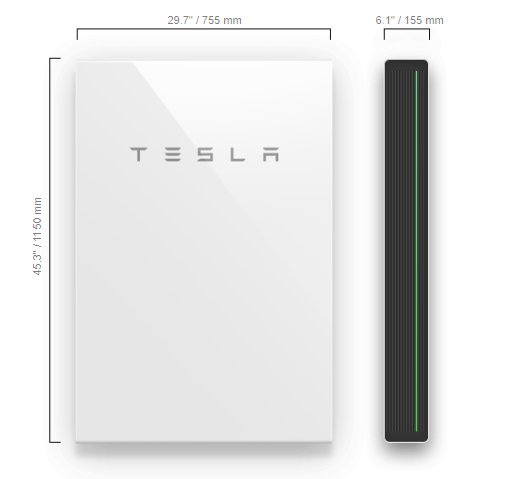 Tesla launched two models, 10 kWh capacity Powerwall for $3,500 and 7 kWh capacity Powerwall for $3,000. In October 2016, Tesla unveiled its second generation residentail battery, Powerwall 2. The company also announced that it has installed 300 MWh of Tesla batteries in 18 countries. How Much does a Tesla Powerwall Cost? In October 2018, Tesla increased Powerwall price from $5,900 to $6,700. Backup Gateway, supporting hardware that controls Powerwall’s connection to the grid costs $1,100. Other installation related cost ranges from $1,000 to $3,000. Total Equipment cost for installing two Powerwalls in a US home is $14,500. Tesla provides unlimited cycle, ten-year warranty for the current generation of Powerwall (Powerwall 2), which means your product is covered for ten years irrespective of the number of times your charge and discharge the Powerwall. Tesla also guarantees that Powerwall 2 will retain at least 70% if capacity during the warranty period. The current generation Powerwall (Powerwall 2) has 13.5 kilowatt-hours of storage capacity, which is more than twice the capacity of the earlier version (Powerwall 1) that had a capacity of 6.4 kilowatt-hours. According to EIA, in 2017 the average annual electricity consumption for a U.S. residential utility customer was 10,399 kilowatt-hours (kWh), an average of 867 kWh per month. Since the average electricity consumption per household is more than 13.5 kWh, a typical US household will need two Powerwalls to power their home for a full 24 hours. How to buy and install Powerwall? Pay Tesla $500 deposit fee. Tesla or a Tesla Certified technician installs the Powerwall.